Remember those guys? 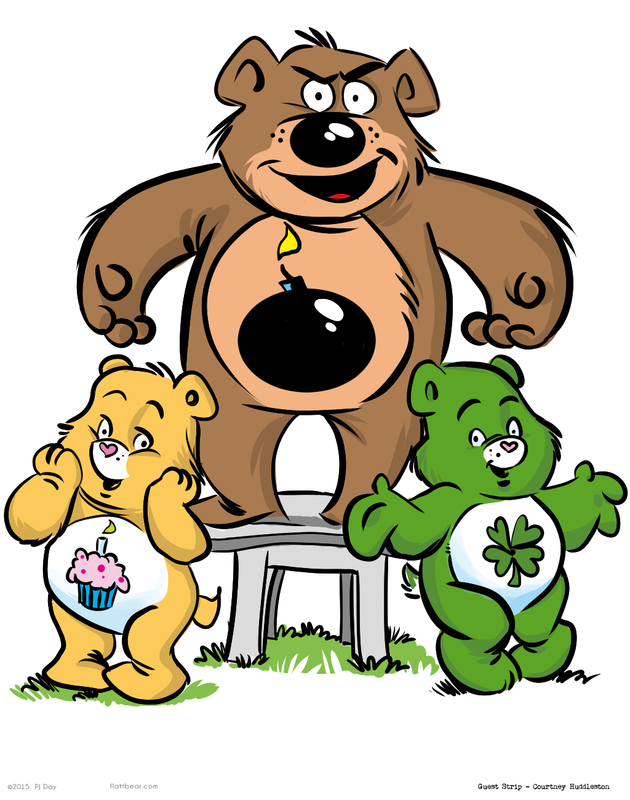 Birthday Bear, Good Luck Bear, and… wait… I don’t remember the brown guy in the middle. Anger Bear? Gunpowder Bear? Shrapnel Bear? Ok. So I’m back from vacation. However, I’ve decided that this is such a good deal for me, letting other great artist’s do my material, that I’m going to just keep this going forever. I mean, comeone! I don’t have stress about deadlines, ideas, and I can get a good night’s sleep. Well… ok, fine. I won’t do this forever. Just one more week. Just one more week of great artists on tap. Today’s cartoonist is none other than the great Courtney Huddleston. He’s another one of those “not sure how I met him, he’s just always been there” guys. I first ran into his work though a comic call Bully’s Bully. I was so impressed by his style and material, I did a Duffy’s Spotlight last year. Courtney is an amazing a creative artist and is even more apparent in his two other strips called Luci Phurr’s Imps and a short-lived strip called Decoy. I will post links here, but alas, all three titles came to and end a while ago and Courtney’s now involved in some other projects that are not online. But, go on over and check’em out anyway. Good stuff. Tomorrow’s strip, the boys try to hide from the boys. Thanks to you I constantly write “flat” with two t’s… so thanks for that. That’s my plan. Taking over the world one “T” at a time. Who’s da bomb? Or is it da bear? A cuddle and an open flame. Now that’s a cartoon I can get into!